How does Ginseng work towards health issues? American ginseng contains adaptogenic natural occuring chemicals called ginsenosides that seem to affect a variety of health issues ranging from insulin levels to infections such as colds and flu, & more. Other adaptogens, called polysaccharides, also help to balance the immune system. Ginseng is used to help balance your body’s over all health by helping your immune system with most health issues you might have. Does Ginseng Berry Juice promote good health? American ginseng contains adaptogenic natural occuring chemicals called ginsenosides that seem to affect insulin levels in the body and help to balance blood sugar. Other adaptogens, called polysaccharides, also help to balance the immune system. American ginseng is often used to fight infections such as colds and flu. There is some evidence that it might help prevent colds and flu and or make symptoms milder when infections do occur. *Ginseng Berry eyed as an anti-diabetic dietary supplement. An extract from American ginseng berry may reduce blood sugar levels by 30% and aid weight loss, reports a study from the University of Chicago using diabetic mice. * American Ginseng Berry Reduces Blood Glucose and Body Weight in obese Mice. *These statements have not been evaluated by the Food and Drug Administration. These products are not intended to treat, cure or prevent disease. CONSULT YOUR PHYSICIAN. Colwells Ginseng makes no claims to its safety or effectiveness. What are some health benefits of Reishi Mushrooms? Reishi mushroom, also known as Lingzhi, like Ginseng, contains adaptogenic chemicals that seem to have a variety of potentially beneficial effects, including activity against tumors (cancer) and beneficial effects on the immune system & more. Reishi mushroom is used for boosting the immune system; helps with viral infections such as the flu (influenza), swine flu, and avian flu, lung conditions including asthma and bronchitis, heart disease and contributing conditions such as high blood pressure and high cholesterol, kidney disease, cancer, and liver disease. It is also used for HIV/AIDS, altitude sickness, chronic fatigue syndrome (CFS), trouble sleeping (insomnia), stomach ulcers, poisoning, and herpes pain. Other uses include reducing stress and preventing fatigue. In combination with other herbs, reishi mushroom is also used to treat prostate cancer. Reishi is commonly touted for its antioxidant and anti-inflammatory effects. Reishi Mushroom is used to help balance your body’s over all health by helping your immune system with most health issues you might have. Are there any new government restrictions on ginseng? While there aren’t any restrictions for growers in PA at this time, the DCNR with the help of Penn State University and growers around the state are considering putting in place a growers program designed to help with the certification process for shipment out of state as well as collecting better numbers on how much seng being shipped is true wild or wild simulated. Some in the state figure if you are a grower, put, plant, sow or however you get ginseng seed put into the ground, the root becomes wild simulated or as the DCNR calls, artificially propagated. As I get more info, I’ll update the readers. Diggers, sometimes it is hard to do. However, you are supposed to get permission from landowners before you look for seng. Without it, not only are you trespassing, you might be digging someone else’s crop and what does that make you? How long should a Ginseng grower/digger let a root mature before harvesting? To insure quality, you need to let that ginseng root grow for at least 8 years or longer. I prefer a 10-20 year span for optimum growth. By law, in every state in the ginseng growing range , you are required to let any ginseng younger than 5 years old in the ground to continue to grow in the hope it will continue to propagate. 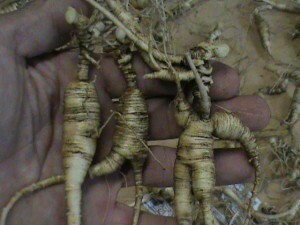 As for the market, I don’t know of any ginseng dealer willing to purchase ginseng root that doesn’t have some age to it. How can you insure the age of what you harvest? The easiest way is to look at the length of the neck as you harvest ginseng. If the neck is at least 1 inch or longer, you should have an 8 to 10 year old ginseng root. The longer the neck, the older the root. You can check the neck size by loosening the dirt around the neck, moving some soil from around the neck, till you see how long the neck is without digging up the whole ginseng root so you don’t disturb all the fiber roots which helps to draw nutrients from the soil. While there is a disease that attacks the neck (rhizoctonia) you can also control the age in some cases by the size of root as well as the amount of growth rings on the root. If conditions are good, the root needs to be at least the diameter of your biggest finger with a lot of growth rings. If you can’t judge by these 2 methods, ask someone in the know or just leave it in the ground. Most buyers don’t want small stick root. How thick should someone plant Ginseng seed? Ginseng seed rates vary greatly depending on growing method. Rates of 20-100 lb of seed per acre are not uncommon. The thicker you plant ginseng seeds, in theory the thicker or more ginseng plants you will have, and the greater the risk you’ll have for disease to become problematic. To keep disease to a minimum, you should try to keep your ginseng plantings to about 2-4 plants per sq ft. to achieve this you will need to plant 4-6 ginseng seed per sq ft. With the avg lb of ginseng seed containing approx. 6500 – 7000 seed, planting 1 lb of ginseng seed to about 1100 – 1200 sq ft should give you about 4 – 6 seed per sq ft. At this rate it will take about 40 lb of ginseng seeds to plant approx. 1 acre. Also , while this practice will not in itself keep disease away, it has proven to be beneficial in the desire to keep disease @ bay. For a novice grower, I recommend smaller rates. It all depends on how much work you want to put forth to keep the plants healthy. How far apart should you plant Ginseng rootlets? Here again, with conditions right, 4-6 ginseng rootlets per square foot is fine, yet it can still get diseased. 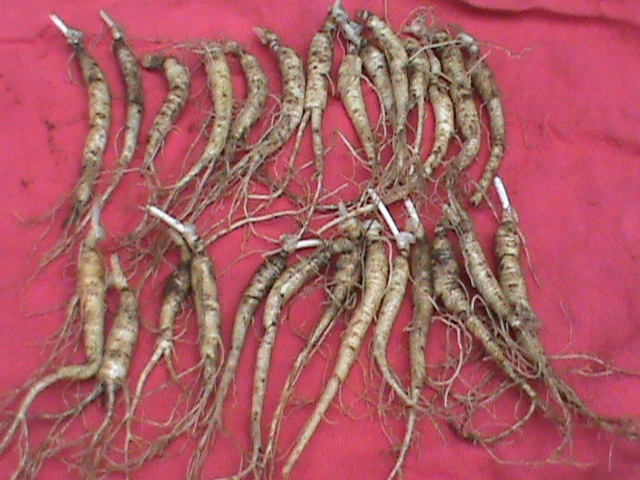 For novice growers we recommend a rate of 2-3 ginseng rootlets per square foot. How does a grower know if they have a disease problem? There are sites on the web with information on the different diseases, how to recognize them & what to do for them. You have to do your homework. There are also ginseng growers who will help other growers with problems. Please note, we also offer consultation services to assist you with these questions; visit https://www.colwellsginseng.com/services for more info.